The cosmopolitan and vibrant Port Town of Dénia is situated at the northern tip of the Alicante province, on the Costa Blanca, that throughout the centuries has always been rich in both history and culture. 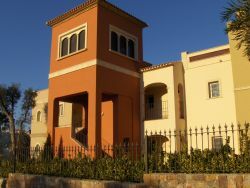 Evidence of the differing cultures that have pasted through the town has included the Carthaginians, Romans, Arabs, Iberians and the Christians, all of whom have left their own legacies to shape Denia into the town that it is today. Denia’s beaches offer remarkable beauty and diversity that includes to the north, 15km of lush "Blue Flag” Sandy beaches and pebble beaches of the Les Marines and to the south is the more rugged and rocky coastline of Les Rotes with its spectacular coves and crystal clear waters that are a pure paradise for both diving and snorkeling. In the historical old centre, where its Castle and Monastery raise majestically up towards the blue Mediterranean sky, you will find the narrow streets around the Loreto with its many restaurants, hotel, hostel, craft workshops, galleries, churches and lively Tapas Bars where in the spring and summer month’s offers medieval markets and street music. At the top of the "Marques de Campo” is The Summer House "La Glorieta” with pretty fountain, café and lots of needed shade beneath the beautiful Bunganvilla and Vines. As you walk down the tree lined Marques de Campo you will find the busy shops, cafes, restaurants, cerveceria’s, ice-cream parlors and lots more until you finally reach the Port area where you can watch the fishermen bringing in their catch of the day, which you can buy yourself from the port fish market, or maybe just board a ferry heading to the Balearic Islands of Ibiza, Menorca, Mallorca and Formentera. Dénia town has lots to offer both locals and visitors alike, the Castle which was built in the eleventh century and now stands as a monument and characteristic landmark of the town, at the top of which is the "Archeological Museum” this is divided into two chambers, they have become famous as the "Palace of the Town Major” located on the upper part of the castle that was erected in the 17th century, you will also find picnic areas for some leisure time and enjoying the views. 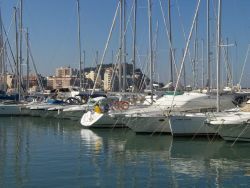 The New Marina is also a pleasant experience to enjoy with top quality restaurants and pleasant promenade to walk by the boats and why not partake in a cocktail or two at the Zenza Bar with its outside swimming pool, 360 degree panoramic views where you can relax and just watch the world and ships go by. If you want things to be a little livelier then Denia is also the place to be, there is no need to be bored here, what with Denia’s social life offering Disco’s, Pubs, Cinema, Bowling Alley, Billiards and Pool Tables, Bingo Room, Jazz Clubs, Theatre and plenty of Live Music. 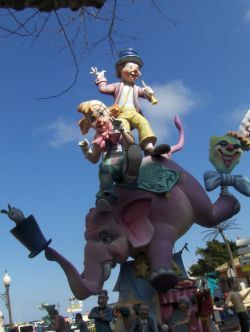 Denia town can also boast the most Fiestas’ on the Cost Blanca, as we once got asked in a Trivial Pursuit question. The Fallas - (Bonfire Festivals). Description: Passacaglias, "mascletaes" (rockets fireworks), music, lunches and popular dinners, fireworks. "Planting" of bonfires, floral offer to Our Lady of the Forsaken and the "Cremà" or burning of bonfires on St. Joseph's night. Moors and Christians – (Fiestas in honour of Saint Roc). Description: Moors and Christians parades, disembarkation in the port, harquebus battle in the castle, concerts, fireworks, etc. 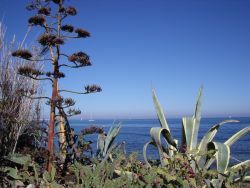 Dénia is sheltered by the Mount Montgó Natural Park which rises 753 metres above sea level that shelters and is home to over 600 plant species, among which are the kermes oak, the red lavender, maritime fennel, the Valencia rock violet, the pretty rock scabious and the palmetto. Denia and its surrounds is also noted for its wildlife, you can watch birds such as the yellow legged seagull or the Audouin seagull, several species of crow, ravens and birds of prey (the partridge eagle, a couple of royal owls, popular kestrel and the pilgrim falcon), reptiles, amphibians and mammals such as the dormouse, rabbit, badger and genet etc. Is found in the heart of the town and offers a selection of daily local produce. Open 7am -2pm (Mon - Sat). Your can purchase Fresh Fish, Meat, Fruit, Bread and Patisseries also enjoy a Tapas and coffee from the numerous cafes inside. In addition on a Monday & Friday extra stalls will be found in the adjoining street selling Fruit & Vegetables and harvested goods. Welcomes everyone to visit the fun and atmosphere of this market held every Monday morning from 8.30am – 2pm at the Carpark Torrecremada Esplanade, you will be able to find everything that a Spanish market has to offer from clothes, shoes, toys and gifts to trinkets. 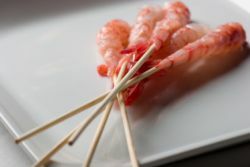 Come and watch the fishing boats arrive at the quay to unload their catch of varying types of fish both large and small also Lobsters, Sea Urchins, Octopus, Anchovy, calamari and Denia’s speciality "Red Prawns”. Fish Market opening times - 5pm (Mon- Fri) all year round. The Dénia tourist train takes many different routes that allows you to enjoy some of the town’s most interesting places, either on your own or as a group of people. Embark on an adventure at sea with Mundo Marino http://www.mundomarino.es/ and Experience a Panoramic Coast Tour or simply enjoy time at sea with a mini cruise. 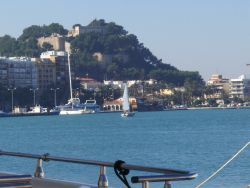 Mundo Marino have many thing to offer including trips to Tarbarca Island Reserve, Champagne Sunset Cruises, a Three Capes Cruise or just simply catch the Aquabus from Denia and spend time in the neighboring towns of Javea and Moraira.